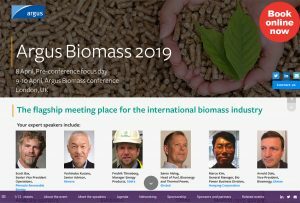 Biomass 2019 – The flagship meeting place for the international biomass industry. DHD have produced the digital event brochure for Argus Biomass 2019 which takes place from 8-10 April in London. Join the most influential leaders in the global biomass industry all under one roof – network with over 400 experts and explore the full premium, industry pellet and wood chip value chain. Why would you benefit from attending Argus Biomass 2019? Meet with the international biomass industry – Do business with organisations that are influencing the direction of biomass markets across Europe, the US, Canada and Asia. Seek new partnerships at the largest international biomass conference in Europe. Hear from influential organisations that are defining and changing market dynamics, including the Department for Business, Energy & Industrial Strategy UK, CM Biomass, SUEZ Trading, Ekman, FLAME, Engie and more. Identify new commercial opportunities, and develop strong links with new entrants in the biomass market. From industrial process heat users to coal traders, the agenda is fine-tuned to attract new entrants to the event in 2019. Are you looking to secure contracts for raw material, wood chips or pellets? Join the largest biomass event in the industry’s calendar, tackle the challenges of availability, and build those vital relationships for business. As new industries look to adopt biomass as a fuel source, the Argus Biomass 2019 agenda tackles fresh topics that will attract new attendees to the event in 2019. This is your unique opportunity to explore the future of the market and the movement towards new biomass sources, including waste wood. Identify how to cut costs across the value chain and improve operational efficiencies at the new cost reduction and technology focus day (8 April). Hear best practice from those companies that are making operational improvements to boost their bottom line. Argus Biomass 2019 offers you a calendar of new networking opportunities; from the morning fun run around Hyde Park to a networking gathering in a hidden and unique part of London, Shepherd Market. Plus! The official networking party will invite you to taste the flavours of the world through a unique culinary experience. Described by attendees as “the go-to event for the biomass industry” and “the best conference for content and networking in the biomass sector” – do not miss your opportunity to meet and do business with global decision-makers at this undisputed industry leading event. Argus Bunker Fuels 2019 – Shape your IMO 2020 strategy. Create connections. Build business.